I am FINALLY able to open up some bottles I’ve had kicking around. And that means I now have too many open bottles again. Someday, someday soon, I’ll figure out how to do things in moderation. In this case it was opening too many bottles, not drinking heavily. Anyway, as my wife would like me to continue finishing bottles, as she is an enabler lovely helper of booze drinking. 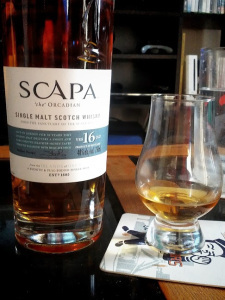 I’ve been nursing the above bottle for awhile now, and feel safe to finally review Scapa 16, ‘the’ Orcadian, from the Sanctuary of Scapa, and all the other names it has. Seriously, I had less nicknames in University, and I had a lot of Nicknames (one was the Legend, but that’s not a story for impressionable minds like Scotchiteers).